"Well done to you all". 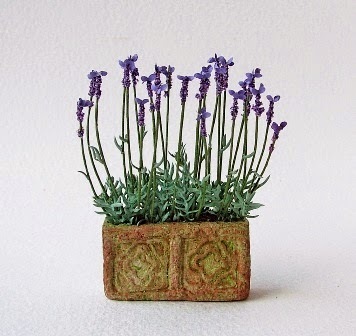 One of those members, Marianne Cooke is a painter who makes miniature plants and flowers mostly in 1/12th scale. Her aim is to make them look as if they were growing in, or had just been gathered from her own garden, which means they are definitely not florist-perfect! Marianne may add a little crack or moss to the pots, and sometimes they even have a weed growing alongside them. Some flowers may be overblown or still in bud and a leaf or three may be blemished which adds to their uniqueness and delight. 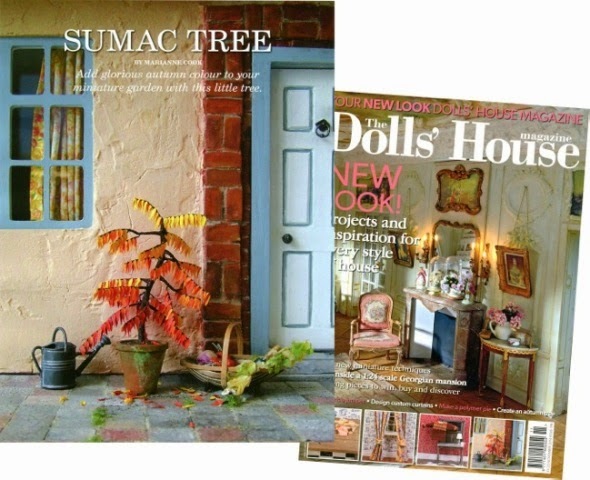 Marianne's contribution to The Dolls House Magazine is a project to make a Sumac tree in 1/12th scale (with brief additional instructions detailing how to adapt it for 1/24th). This colourful addition would be perfect for your autumn miniature garden or in a pot beside the front door. Marianne tells us that it is the first of a number of projects to be included in future issues of the magazine. If you love plants and flowers but are not so keen on hand making them yourself, why not visit Marianne's website or her Etsy shop for many delightful flowers and plants all ready to be placed in your miniature garden.